Mike Nelson: The Coral Reef, 1999, installation view; image courtesy of the Artist and Matt’s Gallery, London, Collection of the Tate. Therefore, what is the value of the Tate’s re-staging of Nelson’s work, or particularly, what is the new value of re-staging it now? The work is primarily an assessment of the effect of belief systems as they are lived on the margins of one, much larger, system. That is to say, that Nelson’s full-throated interest is devoted to an examination of the sort of person who is left out of the hierarchy of capitalism — he incisively observed his own desire for viewers to feel “lost in a world of lost people.” That the work predates 9/11, 7/7 and the 2008 Financial Crisis serves it particularly well. When Matt’s Gallery originally staged The Coral Reef in January of 2000, the world was a different place. It would have been near impossible to envision then, how a series of near-empty rooms could so accurately delineate the assault that capitalist hierarchy has both endured and made on this century. Mike Nelson: The Coral Reef, 1999, installation view; image courtesy of the Artist and Matt’s Gallery, London, Collection of the Tate, image held here. Crucially, one of the rooms is a makeshift gallery reception area. That each room is ascribed a belief system should give the viewer reason to pause and to reconsider the self-imagined position of impartial objectivity, which in turn is similar to the inability of the artwork’s invisible inhabitants to accurately envisage the consequences of their respective belief systems. Nelson is distinctly including informed viewers into his coral reef of fragile structures. The rapid alternation between rooms uncovers the most considered aspect of The Coral Reef — each assemblage refers to a marker of twentieth century misery. A shop front area features a cloth hanging and commemorative plate with likenesses of John F. Kennedy alongside a framed photograph of a stealth bomber. 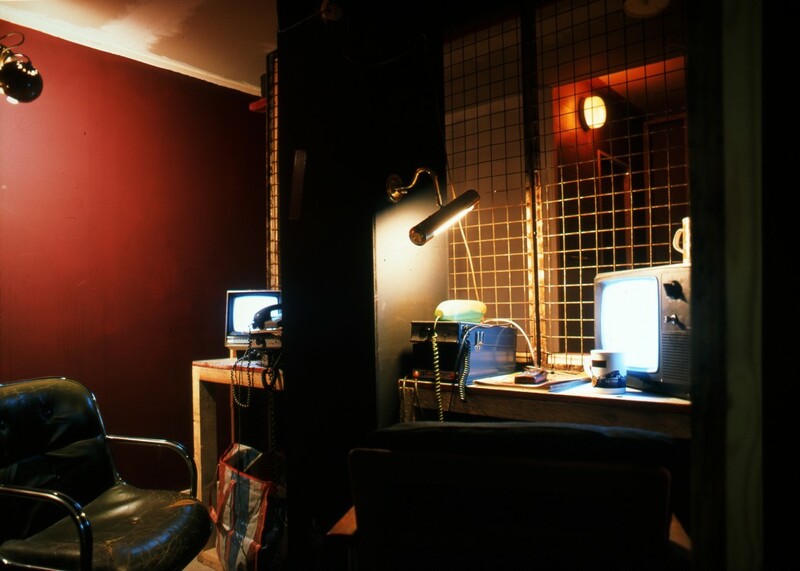 In another room, two flickering security monitors sit on a makeshift desk alongside some aged electronic equipment. One particularly upsetting cubbyhole simply has a sleeping bag on the floor, with three planks of wood as its mattress. There is also a harshly lit room, painted blue and empty except for a broken chair, two unremarkable wall hangings, and a ceiling fan. The fan’s rotation constantly shakes its own fixtures. The artist is intoning that the system presumably hopes that by capturing the ideologies that bloat from its own borders, it can integrate them into its larger superstructure — or to look upon this dilemma another way, that people hurt by capitalism should simply find a way to accept it more painlessly. The Coral Reef provides a strong insight into how the abstract notions of capitalist life infringe on the concrete concerns of people who exist in its towns and cities, but live in a state of removal from its mantra. Enjoyably enough, Nelson is hardly able to take his own point seriously, and frequently endeavours into fantasy — on the counter of one of his rooms is a makeshift tommy gun and a rubber clown mask. The gun and mask have an overtly cartoonish quality; there is no coincidence that they are presented alongside a poster advocating marijuana as an alternative to drunk driving. The Coral Reef is offering the notion that these ‘clownish’ things are all implicated into a broader mechanism of distinctly un-capitalist pursuits. One of the most surprising aspects of the entire construction comes much later in its exploration. Having gotten properly lost, the viewer will seek out the tacky minicab depot that served as the artwork’s original entrance, and having found and exited through it, will not find Tate Britain, but a storeroom for some skips, planks and rubbish. The viewer could construe two of the work’s rooms as final. The first is a bare white room that only offers a scratched, locked door. The second is this exit into the wrong place — which itself prompts a return to the warren in search of a repeat visitation to the small minicab depot. The artist painstakingly reproduced the depot twice to achieve this effect. Each reproduction of a twentieth century non-place feels accurate, Nelson broadly implicates the sharp corners of what he sees as social culture into approximations of fantasy and reality, but refuses to provide an explicit narrative to their larger symphony. He presents capitalism as a ferocious actuality, and imparts a feeling that the function of exemplary Western living does not want to, nor will it ideologically relent to other hierarchies. Seán O Sullivan is a visual artist who lives and works in Dublin. Mike Nelson, “The Coral Reef”, Tate Channel, accessed at <http://channel.tate.org.uk/media/207494480001> NB. This video is more interesting and useful than many images of the work. Helen Delaney, Mike Nelson, The Coral Reef, Tate Publishing, 2010. Is this still going at the Tate Britain? I checked the website but it wasn’t listed. If it’s over, will it be re-built anywhere else in the near future? As far as I know it runs until the end of 2011, their website does a fairly poor job of advertising it. You can see it listed as ‘On Display’ in the ‘collections’ section of the Tate website.